Molefe revisits texts in African Philosophy that have influenced the discourse of personhood. The focus of the chapter is on three such texts. Firstly, Ifeanyi Menkiti’s thoughts on personhood in his article ‘Person and Community in Traditional African Thought’ are examined. Molefe proceeds to consider Kwame Gyekye’s reflections on personhood and his criticisms of Menkiti’s understanding thereof. Finally, Bernard Matolino’s critical reflections on personhood—in the light of Dedier Kaphagawani and Polycarp Ikuenobe contributions—are discussed. 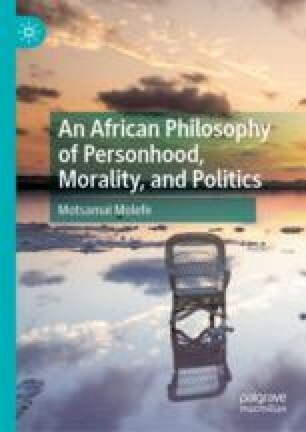 Molefe aims to achieve two things through discussing these texts: (1) to reveal how scholars in African philosophy have historically handled the idea of personhood clumsily; and (2) to clarify the sense in which the concept of personhood will be understood in this book.